The name Tiger Hill does not mean that there are lots of Tigers, but it’s the place for sunrise, lots of visitors are just crazy to see the mesmerizing view of the Kanchenjunga which looks like shining gold when the morning rays sunrise first touches its peaks. After perceiving the glistening view of Kanchenjunga one can’t deny that place is another heaven on the Earth. One should keep few things in mind before moving for the trip to Tiger Hill; first thing you must keep warm jackets, muffler and other warm cloths as per ones needs because it’s very cold during winter season, and should get up early in the morning around 4 am if you really want to see the sunrise. 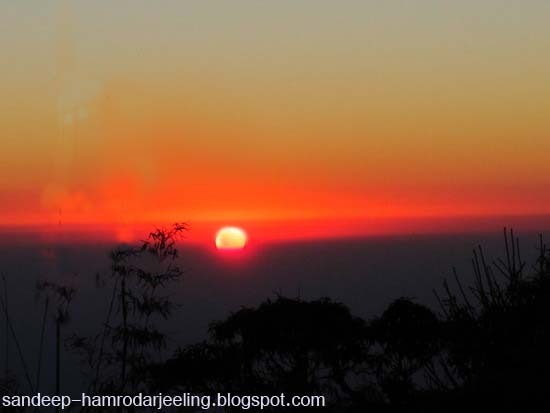 The Hill is about 12 km from Jorebunglow, a place nearby Ghum railway station, from where you can get local taxi at affordable rates. Ghum is the highest railway station for the small beautiful steam engine Toy Train of DHR (Darjeeling Himalayan Railway) which chugs uphill taking visitors close to the nature. This station is at an elevation of 7,410 from the sea level. Tiger Hill is also famous for Sinchel Dham (a Hindu temple, also a water reservoir for the supply of water for Darjeeling town and few surrounding areas of Darjeeling) where thousands of devotes visits ever year.